The new book — Action Comics Superman #14, titled "Star Light, Star Bright" — comes out Wednesday (Nov. 7). Tyson appears within its pages, aiding the Man of Steel on his quest. "As a native of Metropolis, I was delighted to help Superman, who has done so much for my city over all these years," Tyson said in a statement. "And it’s clear that if he weren’t a superhero he would have made quite an astrophysicist." "This is a major milestone in the Superman mythos that gives our super hero a place in the universe," DC Entertainment co-publisher Dan DiDio said in a statement. 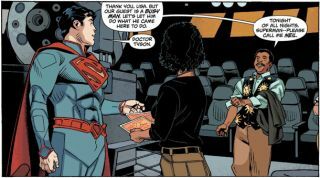 "Having Neil deGrasse Tyson in the book was one thing, but by applying real-world science to this story he has forever changed Superman’s place in history. Now fans will be able to look up at the night’s sky and say, 'That’s where Superman was born.'"